The Kitchen and Bathroom Designers Institute (KBDi) is a hugely important catalyst for Australia's kitchen and bathroom industry. The KBDi is an association of specialist and interior designers that encourages innovation adoption with numerous events all over the continent. Vauth-Sagel attended one of their events in Brisbane as a "silver sponsor" – and Ian Reid, Vauth-Sagel's head of sales in Australia, also illustrated the meaning of "quality made in Germany". 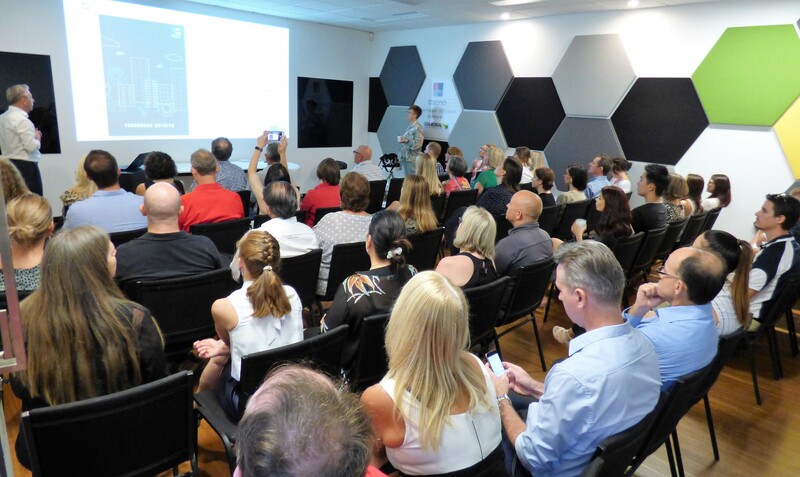 On 27 February, Australian kitchen and bathroom industry professionals and experts met up in Brisbane, the capital of Queensland. In the "Build & Design Centre", more than 60 visitors made good use of the event's most important benefit: the opportunity to network. Over morning tea, they met others from the industry and did business. A Q&A session with the designer Darren James and the surface finish specialist Belinda Worden provided some insights into the world of innovative surface finishes – and Ian Reid from Vauth-Sagel illustrated the advantages of the multi-award-winning corner cabinet solution CORNERSTONE MAXX. The top event was made possible by a number of "silver sponsors" – including Vauth-Sagel. "We use our products to illustrate what we mean when we say 'quality and design made in Germany' – along with some of Germany's other qualities in the form of our 'lucky door' prizes," says Ian Reid. Six lucky winners each received a six pack of German beer, others a bottle of regional German schnapps and a Vauth-Sagel bundle. With the ICONIC AWARDS 2019: Innovative Interior, the German Design Council is honour “the best from all areas of interior design” again this year. There was a new product from Vauth-Sagel amongst the products which met the demanding selection criteria of the jury. VS SUB Comfort emerged from the collaboration with Rietberger Möbelwerke – and brings a new dimension of convenience into the furniture. As a pioneer in the design of modern living spaces, we wanted to know precisely which trends are shaping our present and our future. We wanted to know what gets people excited nowadays, how they set up their homes, as well as their needs and preferences. You will find the results of our insights in our Vauth-Sagel trend report. With it, we would like to encourage you to extend your horizons and to put your heart and soul into shaping the future with extraordinary ideas in collaboration with us. We hope that you enjoy this little journey of discovery into the homes of tomorrow. Vauth-Sagel's waste separation system VS Envi is a modular product range that adapts surprisingly easily to people's individual habits, the size of the household and the local waste management regulations. With as much flexibility as is possible and a well-thought-out range of accessories, VS ENVI makes everyday life considerably easier. VS ENVI Single now fills the last gap in the system: the new element is the first choice for areas where space is limited. Vauth-Sagel's success is based on the company's credo of utilising space in the optimum way, making everyday tasks easier and the extending exacting design standards usually applied only to the kitchen units also to the interior of these units. Every product which the family-owned company develops must meet these requirements. This also applies to the waste separation system VS ENVI, which offers the right solution for all requirements thanks to the range's modular concept. With VS ENVI Single, the latest product in the VS ENVI Range, Vauth-Sagel has now added a solution for smaller households with limited space to its portfolio. In keeping with the Vauth-Sagel promise of creating high-quality living environments for everyone, the company now fills a gap with VS ENVI Single – thereby offering its customers a solutions that is cost-efficient yet also of outstanding quality. To enter into dialogue with architects and designers, to understand their requirements, and to get to know the various markets with their specific requirements – that is the aspiration of the family company for innovative furnishing solutions in the interior furnishing sector. Vauth-Sagel is employing a variety of measures in pursuit of this goal. One of these is the Design Dialogue, which the company organised in Moscow for the first time last year. The response was so positive that the successful format was continued for the second time this year, in parallel to Mebel. Where can we find real kitchen innovations and what are the trends that influence kitchen planning today? What solutions are in demand in the Russian interior furnishing sector? 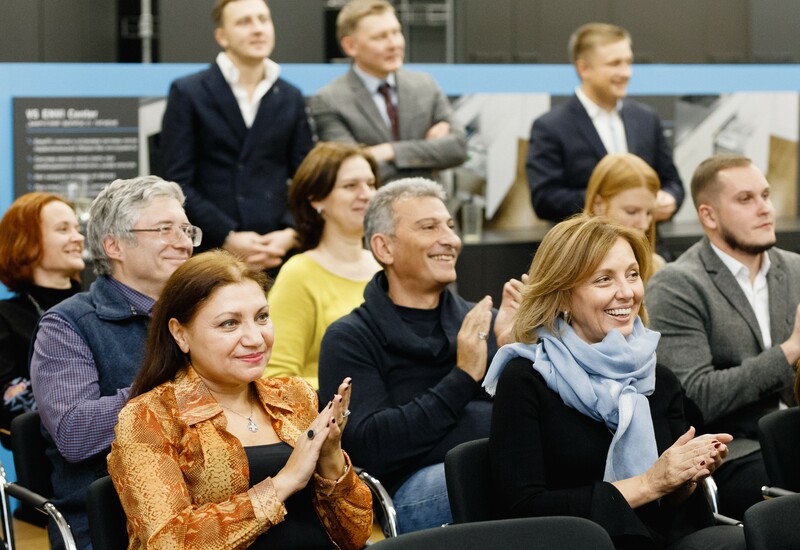 To obtain answers to these questions, Vauth-Sagel invited people to the second Design Dialogue in its showroom in Moscow on 21st and 22nd November. “The success of 2017 shows us that we have found the right format and that the exchange of ideas between everyone involved in kitchen design is welcomed,” says Heinz-Otto Sagel, Managing Director of Vauth-Sagel. 10 years of VS ADD T.O.M. 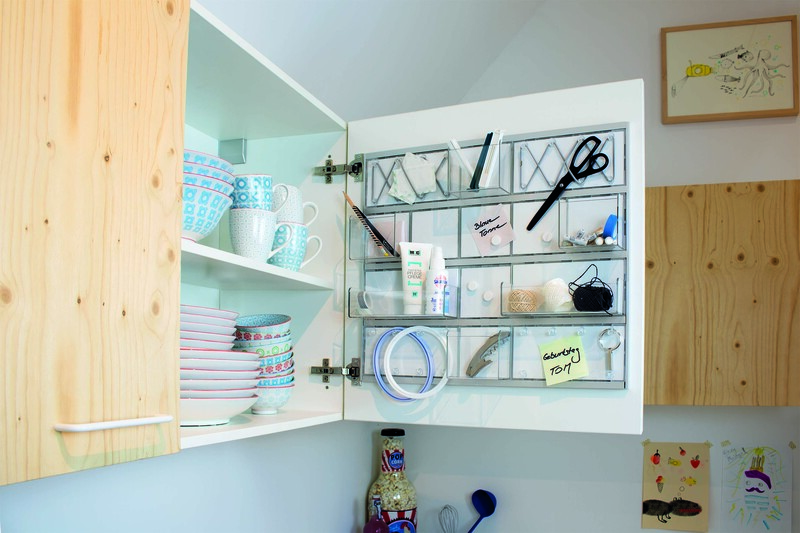 Ten years ago, we wondered how we could store all those little everyday items in a tidy way. Things like scissors, keys or biros that are often just thrown into any old kitchen drawer. That was the moment VS ADD T.O.M. 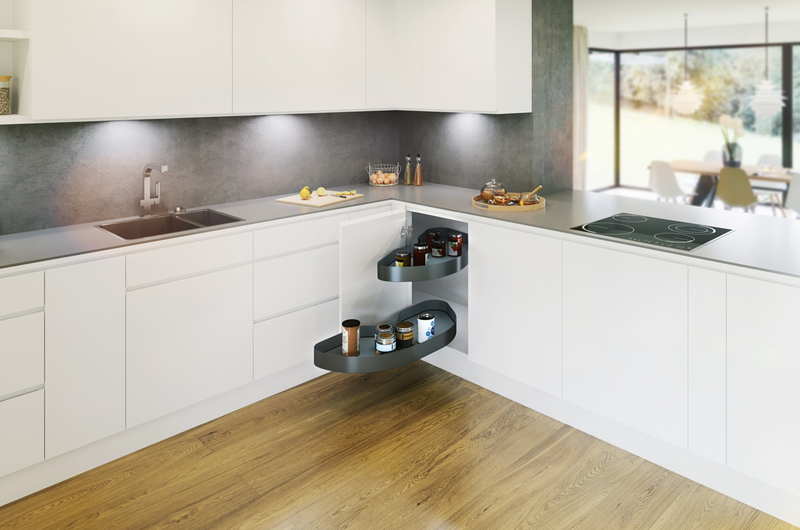 was born, our innovative storage solution that creates new storage space without taking up room or being in the way. T.O.M. stands for "Tür-Ordnungs-Modul", door tidy, which explains straight away what it is, a storage element that is attached to the inside of the cabinet door. However, we thought that VS ADD T.O.M. is too good-looking to be hidden inside a cabinet. Equipped with various storage elements, straps, magnetic areas and rows of hooks, VS ADD T.O.M. is ideal for storing small items that don't really have a proper place anywhere else in the home. As the storage elements can be arranged flexibly, VS ADD T.O.M. is also perfect for other areas beyond the kitchen. It is just as useful inside a wardrobe or in the bathroom, bedroom or living room. 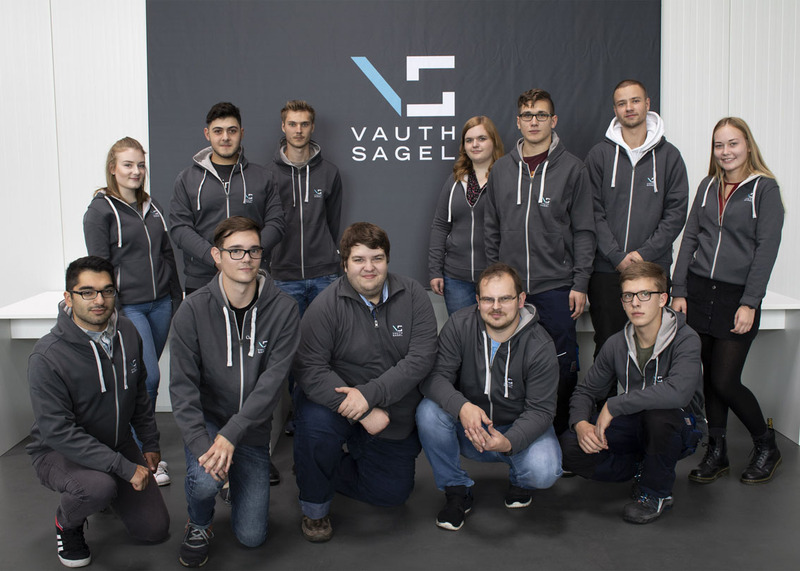 With 23 new vocational trainees and three students on a dual education degree course starting with the company this year, the Vauth-Sagel Group once again confirmed its exemplary approach to helping young people at the beginning of their careers. Under the motto "Welcome, Space Explorers! ", we greeted 26 new team members on 1 September 2018 who will be learning the skills with us they need to successfully complete their vocational training. At our company sites in Brakel-Erkeln, Paderborn, Beverungen and Korbach, we offer technical apprenticeships as well as vocational training in the administrative side of the business. We also offer students the opportunity of gaining a dual education bachelor's degree, which makes us one of the few companies in the region to participate in the dual education degree course scheme. We focus on the quality of the training we provide and also on the career prospects of the young adults we train and therefore offer them attractive career opportunities in our Group when they have completed their apprenticeship or vocational training. Since the 1980s, the number of vocational trainees at Vauth-Sagel has steadily increased. In the past eighteen years alone, we have helped 360 apprentices and trainees to qualify. "We offer sound training, subsequently employ around 90 per cent of our trainees and apprentices and offer all of our employees the chance of further career development and promotion in-house," says Heinz-Otto Sagel. "The employees repay us with outstanding loyalty to the company." The family-run company Piensi has been successful in the ironmongery business for the past 50 years. The company celebrated its anniversary with an event that also provided scope for its partner companies to present themselves. Two hundred guests celebrated specialist retailer Piensi's 50th anniversary in Paratico in the Province of Brescia. 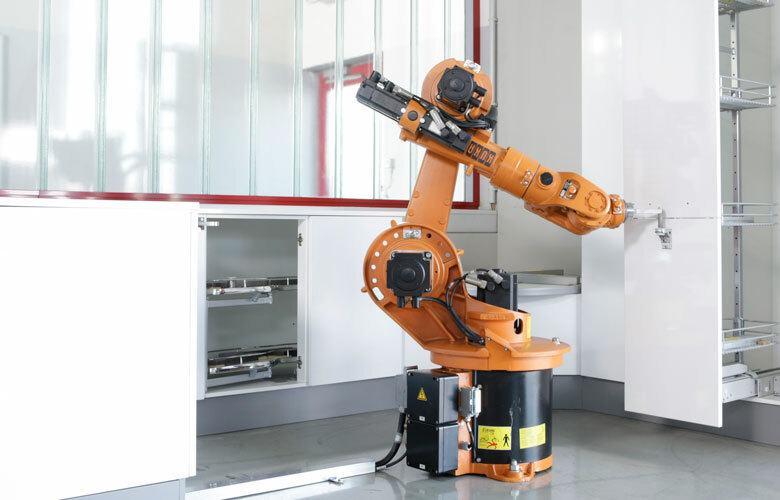 Vauth-Sagel's innovative shop-in-shop system, recently installed in the new showrooms which Piensi moved into last year, was one of the event's special attractions. We also brought our roadshow truck to the event to assist Piensi with the catering with a special focus on local specialities from in and around Brakel-Erkeln in Germany, where our headquarters are located. The visitors were therefore able to taste traditional beer brewed by Vauth-Sagel’s local brewery, Schlossbrauerei Rheder, as well as game sausages, a speciality from the uplands of eastern Westphalia: food and drink of exceptional quality and "made in Germany" – just like our products. During the event, the trade audience of cabinet makers and furniture manufacturers showed great interest in Vauth-Sagel's system solutions. Vauth-Sagel is continuing to expand its international activities with the opening of a new showroom in Brisbane, Australia. In keeping with the company credo "Think global, act local", it is hoped that the company's local presence will also increase the interest in innovative space solutions Down Under. The design of the new showroom matches the company's new corporate identity in order to establish a consistent brand image. Like the showrooms which Vauth-Sagel has already opened in Moscow and Istanbul, the Brisbane branch will serve yet another of the company's key markets. 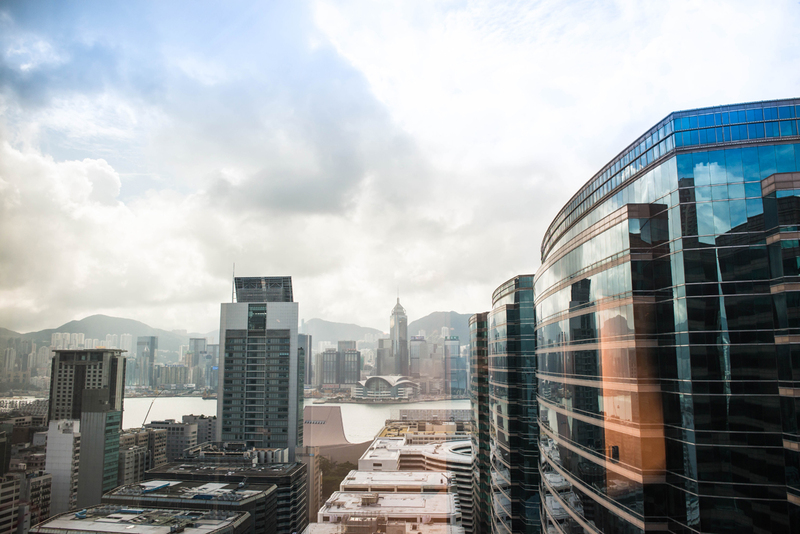 The Asia-Pacific Region is an important growth market. With its future-oriented products, Vauth-Sagel represents an important development partner for numerous businesses in this market. 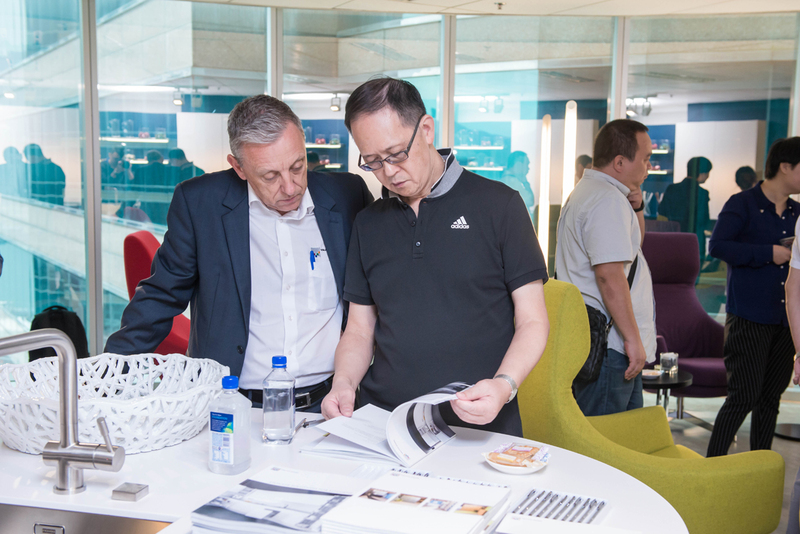 The new Vauth-Sagel showroom is located in the well-known Brisbane Build and Design Centre, where various manufacturers showcase their products and services under one roof. 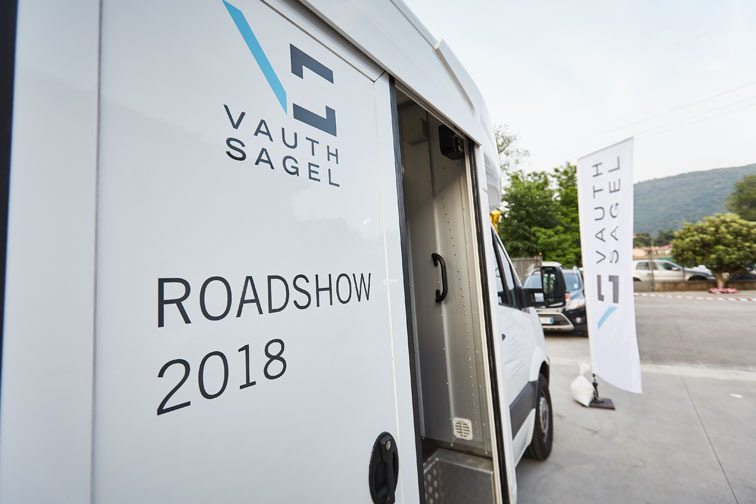 The showroom stands out immediately, thanks to its consistent design that matches Vauth-Sagel's new corporate identity throughout. Vauth-Sagel not only took great care when it came to its design but also when it came to choosing its location: the showroom is situated in Brisbane's South Bank district, the cultural heart of the city and home to numerous venues. 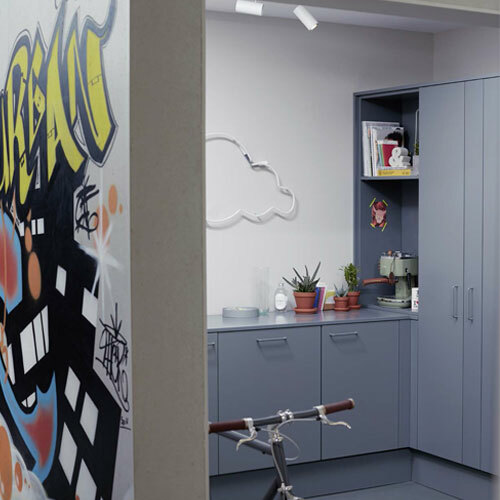 Confined living spaces are not just an urban phenomenon – people also have to make do with very little space in mountain or beach huts and need smart space-saving solutions. The small format edition of "Small Architecture" recently published by Taschen Verlag shows what these solutions actually look like. In this book, Philip Jodidio proves that small spaces can also offer scope for grand architecture and groundbreaking design. Ken Crosson's "Hut on Sleds", a beach hut in New Zealand, impresses with luxury on just a few square metres. The Japanese architect Kota Mizuishi has performed a miracle. On a plot measuring a measly 52 square metres, he has created the "Riverside House", which offers enough space for a family of three. And in the hilly landscape of Ensenada in Mexico, Jorge Garcia has built designer cabins for a hotel that offer luxury yet also blend in beautifully with the surrounding countryside. As different as these three examples are – all of them show that a living space does not necessarily have to be generously-sized to be comfortable. And all of them would hardly have been possible without the interiors designed to make optimum use of the available space. The UN defines megacities as cities where more than 10 million people live. There are currently 36 such mega-conurbations, with a total population figure of half a billion people. In his article "The megacity architects", Tobias Landwehr explains why these megacities are emerging especially in newly developing countries. The architects the title refers to are often the inhabitants themselves: the municipal authorities cannot keep up with the rapid growth; the inhabitants therefore live where they can. This results in uncontrolled building and the creation of favelas or townships, districts "whose names embody municipal mismanagement". However, the author maintains that there is also a positive side to this: innovative ideas for a new urban landscape often come directly from the slums. The saying "necessity is the mother of invention" also applies to autonomous architecture. Tobias Landwehr interviewed various researchers and the city planners and architects from the "Urban Think Tank (U-TT)". In his book, he outlines projects that improve the quality of life in these informal settlements. They focus primarily on the basic needs, which can often be met by surprisingly simple means by those concerned themselves. They include refrigeration systems, self-sufficiency, access to the official employment markets, safety. And of course also the living spaces themselves and how they are used. In keeping with the motto: creating homes worth living in, for everyone, all over the world. Vauth-Sagel presents – a MAXXimum of innovativeness sat the interzum 2017. New logo, new design, new brand strategy and the new CORNERSTONE MAXX. This unique corner unit system will be launched at the interzum and offers everyone MAXXimum performance from all angles. 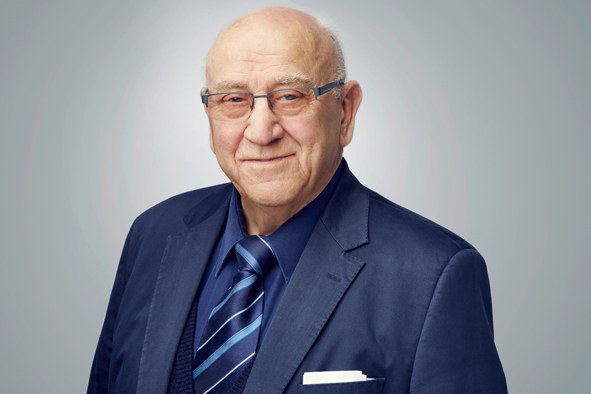 Successful businessman and sponsor Heinrich Sagel celebrates his 80th birthday on 9 February 2017. The Vauth-Sagel Group is one of his greatest achievements. 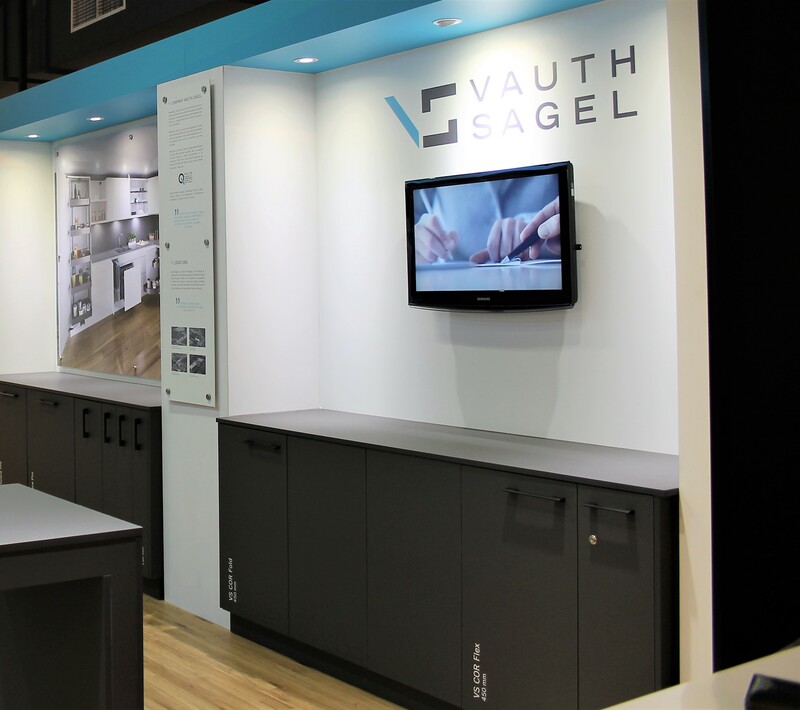 Vauth-Sagel is one of the internationally leading companies when it comes to innovative storage systems for the kitchen and furniture industry. In order to also increase its international market share over the next few years, the company is opening showrooms in key target markets. It is making a start with showrooms in Hong Kong, Moscow and Istanbul that will be future forums for the dialogue with customers, architects, designers and journalists.